If you can resist these new additions to the Decoylab family of nursery-friendly clocks, then you’re made of much sturdier stuff than we. The leaping rabbit and not-so-prickly hedgehog silhouettes are laser cut from quick-growing bamboo, then finished with natural oils to create the cutest timekeepers on the block. If you can resist these new additions to the Decoylab family of nursery-friendly clocks, then you're made of much sturdier stuff than we. 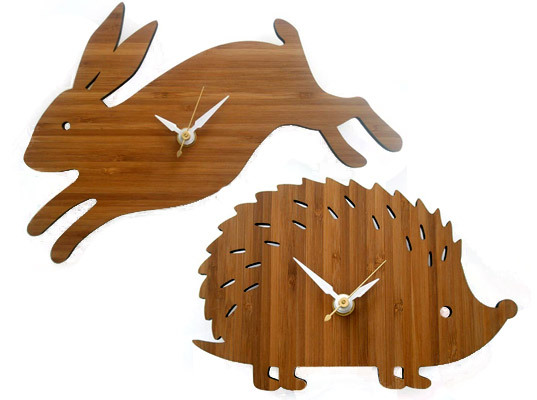 The leaping rabbit and not-so-prickly hedgehog silhouettes are laser cut from quick-growing bamboo, then finished with natural oils to create the cutest timekeepers on the block.